Junior Achievement of Nova Scotia announces the 2019 Laureates for the Nova Scotia Business Hall of Fame: Jack Flemming, Joe Ramia, and Stephanie & Maurizio Bertossi. Halifax (Feb 20, 2019) – JA Nova Scotia has announced the 2019 Laureates for the Business Hall of Fame: Jack Flemming, Joe Ramia, and Stephanie and Maurizio Bertossi. The Laureates will be formally inducted at a gala event, presented by East Coast Credit Union, on June 13, 2019. The event is chaired by JP and Louis Deveau, who were inducted into the Hall of Fame in 2015. The Business Hall of Fame was initiated in 1993 to recognize the contribution made to business by successful leaders and entrepreneurs. The Business Hall of Fame has become an institution of unmatched significance to the business community of Nova Scotia. Each year, JA Nova Scotia and the Business Hall of Fame honour individuals who inspire the business community and future business leaders with a record of unparalleled lifetime achievement. Laureates exemplify growth, courage, success and leadership. The event is hosted and attended by the Business Hall of Fame Governors, Chairman Circle Members, Sponsors and their guests. To become a Governor, a member of the Chairman Circle or to sponsor the event, please contact the JA offices by calling (902) 454-4564 or by emailing info@nsbusinesshalloffame.ca or visiting our website www.nsbusinesshalloffame.ca. JA’s mission is to inspire and prepare young to succeed in the global economy. JA provides hands-on experiential learning in the classroom and through extra-curricular activities. Programs focus on three educational pillars: financial literacy, workplace readiness, and entrepreneurship. JA recruits volunteers from the business community to collaborate on the delivery of programs, which exposes students to real world business perspectives and ideas. Nova Scotia (August 16, 2018) – The Nova Scotia Business Hall of Fame is seeking nominations for its next round of members to be inducted for 2019. The new Laureates for the Nova Scotia Business Hall of Fame will be formally inducted at a gala event in spring 2019, at the Halifax Convention Centre. Laureates hail from different walks of life and diversity is encouraged. Some are entrepreneurs who have built a business from the ground up. Some are executive leaders who have led businesses to new heights through innovation, growth and transformation. And some are the next generation leaders of family business, who have grown a business beyond its original potential. Laureates have demonstrated extraordinary business success, superior leadership values, a commitment to giving back to community and a legacy of achievement in business and philanthropy to celebrate. Posthumous nominations are also welcomed. “The selection of new Laureates for the Nova Scotia Business Hall of Fame is always extremely difficult, and we want to make sure that Laureates are of the highest calibre, and reflect the great diversity of our province,” said Kristin Williams, chief executive officer of Junior Achievement Nova Scotia, whose work helping young people is supported by the proceeds of the Nova Scotia Business Hall of Fame. The Nova Scotia Business Hall of Fame is seeking new nominations with a deadline of November 15, 2018. To review the criteria and submit a nomination, please visit www.nsbusinesshalloffame.ca and complete the nomination form. Once nominations are received they are reviewed and evaluated by two independent committees: a nominating committee shortlists potential candidates, and a judging committee makes the final selections. The Nova Scotia Business Hall of Fame is stewarded by Junior Achievement of Nova Scotia, a registered charity with a mission to inspire and prepare youth to succeed in the global economy. The Business Hall of Fame was initiated in 1993 to recognize the contribution made to business by successful leaders and entrepreneurs. Over 25 years, 89 Laureates have been inducted annually. Each year, the Nova Scotia Business Hall of Fame honours individuals who inspire the business community and future business leaders with a record of unparalleled lifetime achievement. Laureates exemplify growth, courage and success. Junior Achievement of Nova Scotia provides hands-on experiential learning in the classroom and through extra-curricular activities. Programs focus on three educational pillars: financial literacy, workplace readiness and entrepreneurship. JA recruits volunteers from the business community to collaborate on the delivery of programs, which exposes students to real world business perspectives and ideas. Stu began his career in 1976 when he purchased Eastern Cablevison. In 1985, Stu partnered with John Bragg to purchase Halifax Cable. After the sale of his cable interests in 1995, Stu furthered his investment in several other businesses including an airport environmental service company, a wholesale and office supply company and an ice company. Stu believes that with success in business you have a responsibility to give back to your community. Stu has supported the Rath Eastlink Community Centre, Rotary House and the Colchester Hospital. Stu's leadership ability is evidenced by his successful career in Cable TV and his experience on various Boards, most recently where NSBI. These initiatives have enabled Stu to provide advice to aspiring entrepreneurs to flourish. Diane Campbell is President and CEO of Berkeley Holdings Limited, operator of four retirement residences in Halifax. Diane was born and raised in Halifax. She graduated from Acadia University with a Bachelor of Arts Degree and received her Bachelor of Law Degree from Dalhousie University. Diane was admitted to the Nova Scotia Bar in 1968 and practiced law with Daley Black Moreira & Piercey for several years. She served on many boards, including Neptune Theatre, the Discovery Centre and was the Founding chair of the Victoria General Hospital and the Co-Chair of the Heart and Stroke Foundation’s Door-to-Door Campaign. In 2013 Ms. Campbell was the recipient of the Queen Elizabeth II Diamond Jubilee Medal. Rob began his entrepreneurial career in auto-related industries. In 1990, Rob divested his interest in the local franchise of Auto Trader magazines and used the proceeds to purchase the first auto dealership. He proceeded then to build the Steele Auto Group, based in NS, into the largest and most diversified auto group in Atlantic Canada. The Steele Auto Group is recognized as one of Canada’s 50 Best Managed Companies. While building the Auto Group, Rob also joined the Board of Directors of Newfoundland Capital Corporation (TSX-NCC.a, NCC.b) in 1997. In 2001, the Board asked Rob to take a leadership role at NCC were he has served as President and CEO ever since. Junior Achievement of Nova Scotia announces the 2018 Laureates for the Nova Scotia Business Hall of Fame: Stu Rath, R. Diane Campbell and Rob Steele. Halifax (Feb 28, 2018) – JA Nova Scotia has announced the 2018 Laureates for the Business Hall of Fame: Stu Rath, R. Diane Campbell and Rob Steele. The Laureates will be formally inducted at a gala event, presented by East Coast Credit Union, on June 6, 2018. The Business Hall of Fame was initiated in 1993 to recognize the contribution made to business by successful leaders and entrepreneurs. The Business Hall of Fame has become an institution of unmatched significance to the business community of Nova Scotia. Each year, JA Nova Scotia and the Business Hall of Fame honour individuals who inspire the business community and future business leaders with a record of unparalleled lifetime achievement. 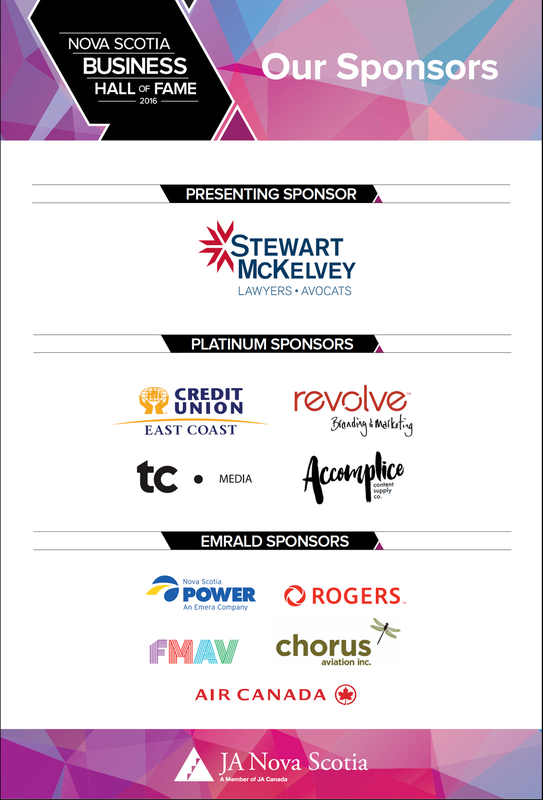 Laureates exemplify growth, courage, success and leadership. .
JA Nova Scotia is pleased to announce the partnership of East Coast, iNova, Teacher’s Plus and Provincial Government Employees Credit Unions as the presenting sponsors of the Nova Scotia Business Hall of Fame Event, to be held on June 6, 2018. 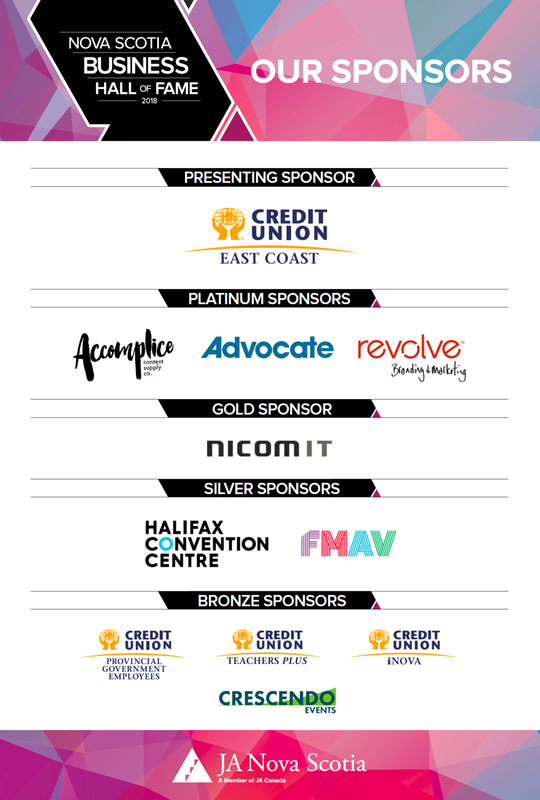 “We are thrilled to have the partnership of metro credit unions lead by East Coast Credit union as our presenting sponsor for the Nova Scotia Business Hall of Fame. As partners, they are deeply engaged in the JA mission as mentors and supporters and alumni. We look forward to sharing in this wonderful journey and a unique collaboration model with East Coast and the metro credit unions!” said Kristin Williams, President & CEO at JA Nova Scotia. East Coast Credit Union is a dynamic, full service, financial co-operative using a member-first approach to partner with individual and business members to achieve financial success. East Coast Credit Union is the largest credit unions in Atlantic Canada with approximately $700 million in assets and serving over 41,000 members from a branch network reaching from Cape Breton to Halifax, giving you more access when and where you need it. They have grown to become a stronger credit union that is focused on investing in your communities, providing competitive products and new services and building relationships with your unique financial needs in mind. Providing convenient and flexible banking options means their members can do their banking any way, anywhere! They are proud to be a part of the credit union system that has been ranked first in customer service excellence out of all financial institutions for 12 years in a row. East Coast Credit Union is locally owned by their members. They are committed to supporting the communities they live and work in through not only financial support but also countless volunteer hours. Teacher Plus Credit Union is a full service, financial co-operative using a member-first approach to partner with individual members to achieve financial success. Teacher Plus Credit Union was started in 1954 as The Nova Scotia Teachers Credit Union and now serves teachers throughout Nova Scotia as well as anyone interested in joining. Teachers Plus Credit Union has over $55 million in assets and serving over 3,000 members from its branch in Bedford, Nova Scotia. Teachers Plus provides a top-quality banking services and honest financial advice including technology that allows you to conduct your banking anytime, anywhere. They are proud to be a part of the credit union system that has been ranked first in customer service excellence out of all financial institutions for 12 years in a row. Teachers Plus Credit Union is locally owned by their members. They are committed to supporting the communities they live and work in through not only financial support but also through charitable support and volunteer hours. The Provincial Government Employees Credit Union is a unique full service financial institution dedicated only to the Province of Nova Scotia's Provincial Government Employees. This difference is integral to who we are; it is what sets us apart. and why our efforts are firmly focused on the financial well-being of Civil Servants. We exist to improve your financial well-being so when you profit, we all profit. As a member focused financial co-operative, iNova exists to serve its members. This means that when you open a banking account with us you’re not just a customer— you’re a member owner. That means we exist to improve your financial stability so that when you profit, we profit. We believe in contributing to the communities we serve in the Halifax and surrounding areas and in this way, are a proud supporter of your community. Contact iNova today www.inovacreditunion.coop. Jonah is a 17-year-old grade twelve student at Citadel High School. After graduation he plans to continue to pursue entrepreneurship especially in the fields of sustainable technology such as electric cars and solar energy. Jonah currently owns a business with his father, Metro Screen Prints, a home-based custom apparel business. Jonah is currently the President of his JA Company Loop (Volta Incubator) where they are creating an application for smartphones tailored to students as a calendar service. Alice is a 16-year-old grade eleven student attending Citadel High School. After graduation next year, she plans to study biology and commerce at the University of Toronto, in hopes of opening her own vet clinic. On Alice’s bucket list is to some day be able to pitch her business idea on CBC’s Dragon’s Den. Alice is currently the President of her JA Company, Dr. Paw (NSBI Incubator) where they have crafted a wax-based organic balm product to prevent dog’s paws from cracking in harsh weather conditions. “JA never fails to push me out of my comfort zone, but it is always then that I realize I am capable of doing all those things I've doubted. Like making a sale, dialing that number I've always procrastinated contacting, and most importantly, creating a company and watching it spiral into something beautiful I could never have achieved without my peers." Alexander is a 17-year-old grade 12 student at Prince Andrew High School. After graduation, he is going to Dalhousie University and entering the Computer Science program. In addition to being involved with the JA Company Program, he is also a member of the Youth Board at the Youth Project in Halifax. Alexander is currently the President of his JA Company, CY-STEM (Lockheed Martin Incubator) where they are designing a trivia application that is entertaining and educational fun activities to help players learn more about Science, Technology, Engineering and Math. Nova Scotia (October 4, 2017) – The Nova Scotia Business Hall of Fame is seeking nominations for its next round of members to be inducted for 2018. Laureates for the Nova Scotia Business Hall of Fame in 2018 will be formally inducted at a gala event on June 6, 2018 at the new Halifax Convention Centre. “Choosing someone for the Nova Scotia Business Hall of Fame is always extremely difficult, and we want to make sure that Laureates are of the highest calibre, and reflecting the great diversity of our province,” said Kristin Williams, chief executive officer of Junior Achievement Nova Scotia, whose work helping young people is supported by the proceeds of the Nova Scotia Business Hall of Fame. The Nova Scotia Business Hall of Fame is seeking new nominations with a deadline of November 15, 2017. To review the criteria and submit a nomination, please visit www.nsbusinesshalloffame.ca and complete the nomination form. Once nominations are received they are reviewed and evaluated by two independent committees. A nominating committee shortlists potential nominees, and a judging committee makes the final selection. Halifax, June 6, 2017 – On May 31, 2017, Jim Eisenhauer, Michael Donovan and Chris Huskilson were inducted into the Nova Scotia Business Hall of Fame during a celebration of the event’s 25th anniversary. The event was attended by over 1,000 c-suite executives and business leaders from all corners of industry. The event is hosted by a board of governors and chairman circle members, and past laureates serve as ambassadors for JA Nova Scotia. Through sponsorship, table sales, a raffle and personal pledges, the event raised $544,896 in support of JA Nova Scotia programs, which was a record for the event. The event was chaired by Colin MacDonald; 2015 Laureate, corporate sponsor and personal donor. In addition to JA youth emcees and laureate speeches, the event also hosted a tribute in honour of all new, current and past laureates. Over the history of the Nova Scotia Business Hall of Fame, 89 Laureates have been inducted into the Hall. This was the first time that the laureate community was brought together in this way and the tribute represented the legacy of leadership and entrepreneurship in Nova Scotia. JA also took the opportunity to talk about the future home for the Nova Scotia Business Hall of Fame portraits, which is slated for the Nova Centre. More information will be released about the plans in the coming months. JA Nova Scotia was challenged with a tough year due to conditions beyond their control, including the protracted labour dispute and school weather closures. As a result, the event was a critical opportunity to raise desperately needed funds to secure the stability of the organization. During work to rule, JA Nova Scotia expanded its community based programs, reaching students as young as pre-primary and up to age 25, with programs in financial literacy, workplace readiness and entrepreneurship. They also partnered with other non-profit organizations to reach underserved, marginalized and at-risk youth. “We would like to take this opportunity to thank our community of support, including our Laureates, our sponsors, governors and chairman circle members, our guests, and the amazing volunteers who assist us every day in delivering our mission” said President and CEO, Kristin Williams. Halifax (Feb. 23, 2017) – Junior Achievement of Nova Scotia has announced the 2017 Laureates for the 25th anniversary of the Nova Scotia Business Hall of Fame: Chris Huskilson, Jim Eisenhauer and Michael Donovan. The Laureates will be formally inducted at a gala event, presented by Stewart McKelvey, on May 31, 2017. The event is hosted and attended by the Business Hall of Fame Governors and their guests. To become a Governor, a member of the Chairman Circle or to sponsor the event, please contact the JA offices by calling (902) 454-4564 or by emailing info@nsbusinesshalloffame.ca or visiting our website www.nsbusinesshalloffame.ca. Halifax, NS (June 8, 2016) - On June 2nd, George Caines, QC, David Read and Pete Luckett were inducted into the Nova Scotia Business Hall of Fame, presented by Stewart McKelvey. The event was attended by c-suite executives from all corners of industry and raised $299,750 for Junior Achievement of Nova Scotia! We would like to take this opportunity to formally acknowledge and thank everyone who attended and supported this year’s event! Only 36 Days Remain! -- Book Your Table Today! Halifax (Feb 25, 2016) – Junior Achievement of Nova Scotia has announced the 2016 Laureates for the Business Hall of Fame: David Read, George Caines,QC and Pete Luckett. The Laureates will be formally inducted at a gala event, presented by Stewart McKelvey, on June 2, 2016. The Business Hall of Fame was initiated in 1993 to recognize the contribution made to business by successful leaders and entrepreneurs. For nearly 25 years, the Business Hall of Fame has become an institution of unmatched significance to the business community of Nova Scotia. Each year, Junior Achievement of Nova Scotia and the Business Hall of Fame honour individuals who inspire our business community and future business leaders with a record of unparalleled lifetime achievement. Laureates exemplify growth, courage, success and leadership. The event is hosted and attended by the Business Hall of Fame Governors and their guests. To become a governor and a member of the exclusive 90-Club, please contact the JA offices by calling (902) 454-4564 or by emailing info@nsbusinesshalloffame.ca or visiting our website www.nsbusinesshalloffame.ca. The event will be held at WTCC. Reception begins at 5:30 pm with the dinner and ceremony starting at 6:30 pm. Junior Achievement of Nova Scotia provides hands-on experiential learning in the classroom and through extra-curricular activities. Programs focus on three educational pillars: financial literacy, workplace readiness, and entrepreneurship. Junior Achievement recruits volunteers from the business community to collaborate on the delivery of programs, which exposes students to real world business perspectives and ideas. Junior Achievement’s mission is to inspire and prepare young to succeed in the global economy. 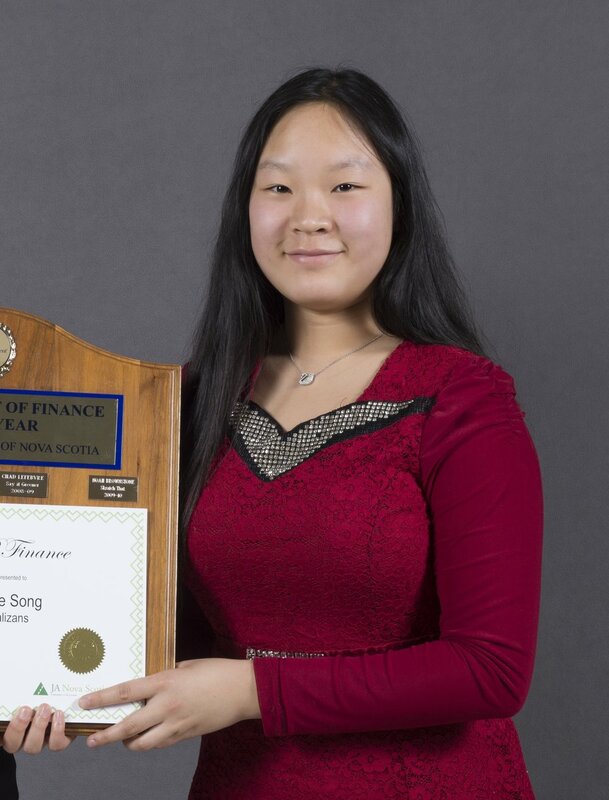 Each year, three Junior Achievers from Company Program are hand selected to help JA host the Nova Scotia Business Hall of Fame. On June 2, one achiever will introduce one of our 2016 Laureates. Halifax, NS (June 1, 2015) - On May 28th, Louis and Jean-Paul (JP) Deveau, Michael Duck and Colin MacDonald were inducted into the Nova Scotia Business Hall of Fame. The event was attended by 830 c-suite executives and industry leaders and raised over $277,158 in support of Junior Achievement of Nova Scotia! We would like to take this opportunity to formally acknowledge and thank everyone who attended and supported this year’s event! 2016 Nominations are now being accepted!